The following is a partial list of the late Dr. Harold T. Hammel's publications in the area of osmosis. Follow this link to an introduction to Dr. Hammel's ideas to an introduction to Dr. Hammel's ideas. Follow this link to a patent application addressing high altitude pulmonary edema ("HAPE"). 2) Alan R.Hargens, Lemuel J. Bowie, Deborah Lent, Sylvester Carreathers, Richard M. Peters, H. T. Hammel, and P. F. Scholander (1980) Sickle-Cell Hemoglobin: Fall in Osmotic Pressure upon Deoxygenation PNAS, Jul 1980; 77: 4310 - 4312. 4) Hammel, H. T. (1994) How solute alters water in aqueous solutions. J.Phys.Chem. 98: 4196-204. 5) Hammel, H.T. (1995) Boltzmann's Principle Depicts Distribution of Water Molecules between Vapor and Liquid for Pure Liquid and for Aqueous Solutions. J.Phys.Chem.99:8392-8400. 6) Hammel, H. T. (1995) Role of colloidal molecules in Starling’s hypothesis and in returning interstitial fluid to the vasa recta. Am. J. Physiol. 268:H2133-44. 7) Hammel, H.T. (1998) Replacing Lewis's theory with Hulett's theory of altered chemical potentials of reacting constituents in solution. Recent Res. Devel. in Physical Chem. 2:77-111. 8) Hammel, H. T. (1999) Evolving ideas about osmosis and capillary fluid exchange. FASEB J. 13: 213-231. 9) Hammel, H. T., Brecheu, W. F. (2000) Plasma-ISF fluid exchange in tissue is driven by diffusion of carbon dioxide and bicarbonate in presence of carbonic anhydrase. FASEB 14: Abstract 315.3. 10) Brecheu, W. F., Hammel, H. T. (2002) Causes of plasma-ISF exchange in fish, birds and mammals. FASEB J. 16: Abstract 657.1. 12) Hammel, H.T. (2005). 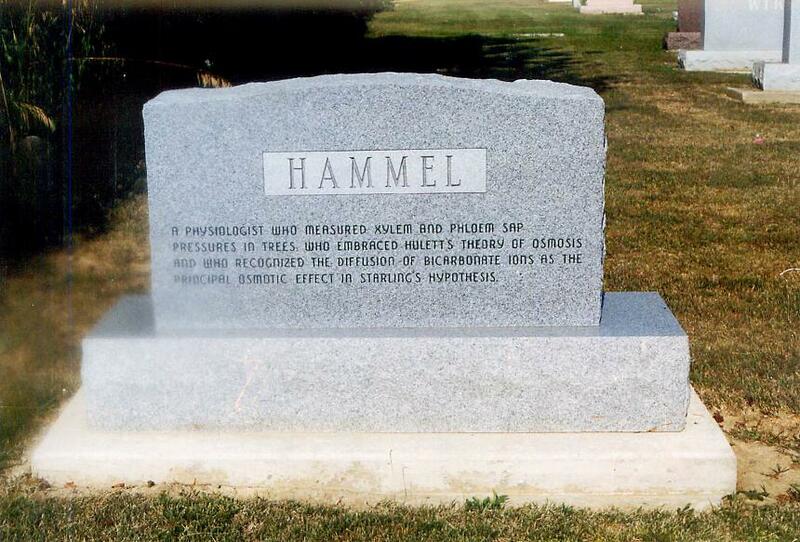 Dr. Hammel wrote for publication until his passing. His last publication is the headstone on his grave. The text reads: "A physiologist who measured xylem and phloem sap pressures in trees, who embraced Hulett's theory of osmosis and who recognized the diffusion of bicarbonate ions as the principal osmotic effect in Starling's hypothesis."